We take great pride in offering solutions to all aspects of our customers’ sizing requirements. Whether it is a high capacity production separator or a single sieve used in lab analysis, it is our goal to assist you with your application needs. To better serve our customers we now offer a full line test sieves. 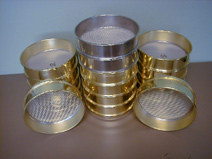 Each test sieve is guaranteed to meet the American Society for Testing Materials (ASTM) specifications. A certificate of analysis is supplied with each individual sieve. The nameplate shows the sieve designation, microns and nominal openings in both millimeters and inches. A permanently etched serial number is also included for traceability and quality control. Alternative No. Nominal Openings In. Standard M.M. Did you know we carry alternates to name brands such as Rotex®? Save money by purchasing replacement screens and screener parts from Custom Advanced. If you have an old Rotex® or Great-Western® screening product and don't want to pay O.E.M. prices to replace them, count on Custom Advanced to save you time and money.